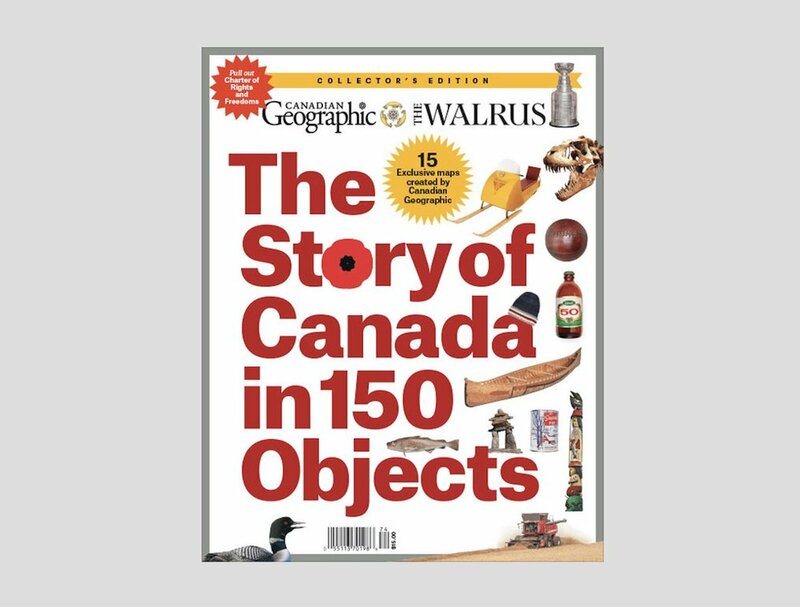 FROM "THE STORY OF CANADA IN 150 OBJECTS"
Every summer, toward the end of July, Perry Peterson drives three hours to traipse around the Ontario bush looking for wild blueberries. They are hard to find, which for him is the draw. Sometimes he finds only a cupful. Other years, he fills pails for jam. His wife has suggested that he just plant blueberries in their Kingston, Ont., backyard, which has a voluminous garden, but he won’t. He views searching and exploring as fundamental human experiences, and insists on foraging like hunter-gatherers of old. Peterson, an Edmonton-born army brat who’s the chief engineer and founder of a small Calgary-based software company called the PYXIS Innovation, views the Internet in a similar way. What he can get easily — the deluge of textual and visual information at our ngertips — he finds both mind-blowing and lacking. He wants a deeper online experience of exploring the Earth. “The Internet is everything but geospatial,” he says. “You can ask questions, but it’s text-based, it’s not spatial-based. It doesn’t feel like the human experience of searching and exploring a place.” This, to him, is a glaring deficiency. This is what Peterson’s team of 14 has created: a virtual globe, built with a spreadsheet of hexagonal cells that cover the planet’s surface. Each cell is tied to a specific place, and can be instantly filled, on the fly, with data sets pulled from myriad online sources including governments. (This tiling system is the “innovation” referenced in the company’s name.) “Like Google Earth, but on steroids,” is how Lynn Moorman, a professor of Earth sciences at Calgary’s Mount Royal University and a PYXIS advisor, describes it. At a recent conference on the Arctic, Peterson gave a demo. The topic at hand was permafrost thaw caused by climate change. He plugged in his laptop and loaded PYXIS’s web software, called PYXIS Studio, in his browser (it’s publicly available at pyxisglobe.com). Within minutes, he’d shown on PYXIS’s virtual globe where the permafrost will move in Northern Canada between now and 2050 if humanity doesn’t alter its carbon output. “All of those pipelines and roads and things we’ve built on permafrost — Canada’s in big trouble,” says Peterson. “That’s going to be very expensive.” Using PYXIS Studio, you can see what infrastructure will be affected when. Even on road trips, Peterson diverts from the beaten path to explore, often writing poetry as he goes. In 2013, he and Johnson drove from Alberta to Ontario by the most northerly route possible, snaking through the boreal forest on gravel roads. He sees their propen- sity for exploring the country’s wilder parts as quintessentially Canadian. “We’re attached to our geography,” he says. “But we have to realize that we change the environment.” Peterson adheres to the leave-it-better-than-you-found-it concept he learned as a Boy Scout. PYXIS’s evangelistic cause, along with everyone working in the field of Digital Earth, was helped greatly after Google Earth came out in 2005. People could now see an interactive globe on their computer screens and spin it around, exploring at will. “Still, there wasn’t really an interface to start to ask questions,” Peterson says. For all its simplicity, you still couldn’t access and analyze the reams of information — everything from census data to rural crop types — that were increasingly being put online as the open data movement gained momentum. Most organizations, meanwhile, were still using traditional geographic information systems (GIS). Pre-PYXIS, Peterson and Johnson did GIS work for municipalities and kept encountering a frustrating problem. A city’s engineering department would make a map of an area at one scale, and the transportation department would do another map of the same area at a di erent scale. If you wanted to instantly integrate the data from separate maps, you couldn’t. A GIS technician had to do it manually — basically taking apart the two-dimensional maps and reconstructing them, an expensive and time-consuming process. To Peterson, this work of constantly re-creating maps wasn’t just cumbersome. He saw it as unnecessary. He wanted to get rid of this process altogether, which didn’t go over well with some GIS technicians. Peterson likens two-dimensional maps using latitude and longitude to vinyl records: they are analog. He wants to replace those coordinates with a new reference system. But like a crackling Joni Mitchell LP, traditional maps have a certain familiar appeal. “We like this idea of digital data, geographic data being composed of maps, and it’s taken us a long time to escape that basic limitation,” says Michael Goodchild, an emeritus professor of geography at the University of California, Santa Barbara, who is one of the world’s foremost GIS experts and a PYXIS advisor. He points out another major shortcoming of two-dimensional maps: attening the Earth’s surface distorts it, particularly in the polar regions. In the 1990s, while a partner in his own engineering practice, Peterson saw a solution in hexagons. He first got the idea while studying civil engineering at Lakehead University in Thunder Bay, Ont. There, he’d watch his classmates hunch over board games such as Richthofen’s War and PanzerBlitz, many of which used hexagonal grids to recreate historic battlefields. Each hex contained information — land, water, political borders — that affected how the game pieces moved. In class, he argued with a professor over the best way to calculate rainfall runoff in a watershed. His mind went to the war games, and he wondered: if you can grid a game surface into cells, shouldn’t it work with the Earth’s surface too? Similar to the games, each hex could contain data on soil moisture, forest cover and rainfall intensity. He built a computer model and sure enough, it spit out a chart that aligned perfectly with the hydrograph from the real watershed. The flow rates matched. “That was the beginning of understanding: we could do this to the whole globe,” he says. In 2003, PYXIS created a single 8 1/2-by-11-inch page containing an elegant printout of their tiling system, with tiny hexagons inside ever-larger ones. It resembled a snowflake, and the company used this illustration to sell Defence Research and Development Can- ada on their concept. The military bought in, licensing PYXIS’s technology for its use. This presented something of a moral conundrum. It wasn’t that Peterson was uncomfortable with the army — quite the opposite. His dad was in the army, and by the time Peterson was five years old, his parents had been stationed from Edmonton to the Ruhr Valley of Germany. “In those formative years between age five and nine, I grew up travelling around Europe,” recalls Peterson. He followed in his father’s footsteps, joining the military after high school because he wanted to learn to fly. In his downtime, he tinkered with his Commodore vic-20 (circa 1980) to model fluid flow over an airplane wing. Even then, he was interested in modelling real life in a computer. But while he grew up with the military, he was also steeped in the social outreach traditions of the United Church. He viewed life as a sacred journey. “He is very philosophical,” says Vanessa Pizzinato, who has worked with Peterson as a marketer periodically since the early 2000s. “He really likes to think about things.” And he did not particularly relish the idea of people killing each other in war. The PYXIS software is being regularly tweaked, but it has the elements Peterson has long sought: a way to search and explore the Earth’s surface online. In his 1998 speech, Gore conjured the image of a girl, in the future, going to a Digital Earth exhibit in a museum, where she embarks on a virtual three-dimensional magic carpet ride through the Earth’s terrain. She can instantly get information on such things as distribution of plant and animal species, roads and real-time weather. Peterson’s team kept returning to Gore’s vision: the technology should be simple enough for a child to use. “People have gotten used to the idea that any kind of analyses on the Earth are very complex operations,” says Wade Hardman, PYXIS’s creative director. “Perry’s taken all of that complexity and continued to, over the years, boil it down.” PYXIS is working with educators to introduce the technology in schools.